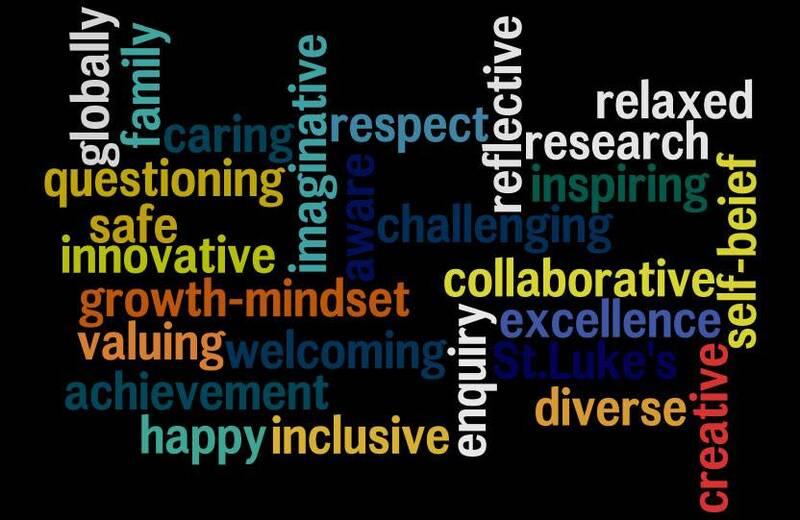 St. Luke’s will be a welcoming, caring and happy school where the talents of all are nurtured and everyone has a voice. It will be optimistic, reflective, ambitious and relentless in its drive for continual improvement and excellence. The school will be at the heart of our community. It will imaginatively engage all its members, supporting their well-being and offering guidance to all those who need it, during the school day and beyond. Through clear shared values and an inclusive vision, we will break down barriers, challenge inequality and inspire children to become life-long learners. We will aim for high achievement in all areas and create children who are confident, independent and empathetic learners. They will be healthy, self-aware, questioning, socially responsible and positive citizens. They will understand the global context of their lives and how they can contribute to sustainable growth. They will be enquiring, willing to take risks, to seek out challenges and be fully equipped for a rapidly changing world. Our children will be happy, curious, positive, resilient young people, with high self- esteem and self-belief, who love to learn, contribute fully to school life and achieve well. They will have “growth mindsets” and they will learn well with and from others, enjoy challenge and appreciate constructive criticism, understand the learning process, are resilient and recognise that success comes through effort, practice and perseverance. We will provide a dedicated team of staff who are committed to developing children’s knowledge, skills, attitudes and understanding and who inspire them to enjoy learning, achieve success and feel content and fulfilled. They will be reflective and dedicated to continuous learning for themselves through applying and developing successful research based practice. We will work closely with all our parents and carers to support their children’s attendance and progress at school. We aim to ensure that all parents and carers feel part of the school community and share its values, so that all the children can reach their full potential. St Luke’s will support parents and carers by keeping them informed of the curriculum, their children’s progress and by providing supporting materials to help their children at home. St Luke’s will encourage regular input from parents by creating a friendly and welcoming atmosphere. We will seek to fully involve them in key decisions regarding their children’s education and welfare. We will endeavour to create a safe, stress free, high quality learning and work environment, which reflects the high value we place on education, children and the professionals within it. It will stimulate and nurture children’s learning. It will celebrate the rich diversity of our community and beyond and it will fully support every need. There will be a creative, inspiring and experiential curriculum that constantly evolves and enables our children to be successful citizens of the 21st Century. It will draw on the talents, innovative thinking and teamwork of all the staff and the rich resources found in the local, national and global community. It will be founded on exciting personalised learning programmes which reflect the diversity in our community. We will fully embrace technology in all areas of our school life in order to enhance teaching and learning and our overall effectiveness. We will be a learning organisation, committed to research and continually promoting the training and development of all. Through flexible local, national and global networking we will lead on innovation and excellent practice in all areas. We will be a reflective organisation that listens to and learns from all our stakeholders, engages in continuous self-evaluation and improvement and is fully committed to the well-being of all.